In order for you to request or submit information to us, we may ask you to provide personal data such as your name, postal address, telephone, fax number and e-mail address. When you submit personal data to us, you understand and agree that this data will be supplied to IEPUK who will take appropriate steps to ensure that personal data is protected from unauthorised use and kept in a secure manner either electronically or on manual records. If you change your mind about being contacted in the future, please let us know by phone or by emailing ws@iepuk.com. If you would rather not receive information about special features of our Website or any other service we think may be of interest to you, please send an e-mail message to ws@iepuk.com. We may also want to provide you with related information from third parties we think may be of interest to you. If you would rather not receive this information, please send an e-mail to ws@iepuk.com. We may also use contractors and professional advisers. Where these contractors require access to personal information, we will ensure compliance with the DPA and that your information will be kept confidential. They will not use your information except as necessary to operate the websites or IEPUK, and will not use it except in line with this privacy notice. You can opt-in and opt-out of receiving promotional and marketing information from us. You can do this by sending an email to ws@iepuk.com. We may revise this Privacy Notice at any time by posting such revised Privacy Notice at www.IEPUK.com. Your continued use of the site will mean you accept those revisions. The data controller is IEPUK. 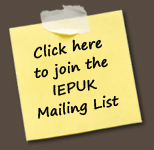 You can write to IEPUK, 18 Leicester Road, Uppingham, Rutland, LE15 9SD. We are Registered under the Data Protection Act. If you have any questions about this privacy notice, the practices of this site, or your dealings with this website, you can contact: ws@iepuk.com.